Writing is like making a mosaic. Take some pieces of life, reshape them, and put them together again in a new way to form a little aha! of recognition and knowledge. 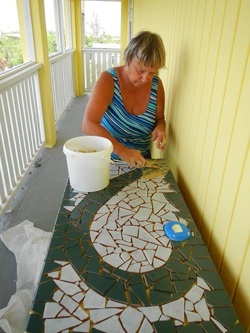 I have been a writer a lot longer than I've done mosaic art, but it wasn't until I was busy cutting tiles, gluing and grouting that I realized the beautiful connection. This site offers a bit of both my worlds. Please feel free to comment or email me for deeper views, copies of short stories or questions about mosaic commissions. Photos by Tom Rathgeb and Jody Rathgeb. Mosaics by Jody Rathgeb.